"Sampath Speaking" - the thoughts of an Insurer from Thiruvallikkeni: Beijing Marathon and the smog out there !! Beijing Marathon and the smog out there !! Smog is a type of air pollutant. 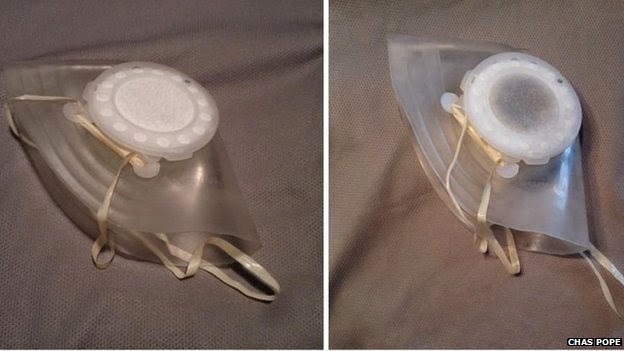 It can be the air pollution derived from vehicular emission from internal combustion engines and industrial fumes that react in the atmosphere with sunlight to form secondary pollutants that also combine with the primary emissions to form photochemical smog. There are some cities where the pollution is so high and they are toxic too. Ethiopia, the country located in the Horn of Africa is often in news for wrong reasons. With about 87.9 million inhabitants, Ethiopia is the most populous landlocked country in the world. Some of the oldest evidence for modern humans is found in Ethiopia – civilization existed thousands of years ago here. Ethiopia was the only African country to defeat a European colonial power and retain its sovereignty as an independent country. Though the past is glorious, the present is not – while future is very tense. Western World has portrayed Ethiopia highlighting malnutrition and hunger – they cost the Nation billions of dollars in yearly economic losses according to the UN World Food Program (WFP). It is sad to read that more than two out of every five children in Ethiopia are stunted and more than 80 percent of all cases of child under-nutrition go untreated. It says malnutrition in Ethiopia causes more than 20 percent of child deaths. Marathon races are held across the globe … the Beijing International Marathon is an annual marathon race of 42.195 km held in October in Beijing, People's Republic of China. The race was first held in 1981 and has been held every year since. The race begins at Tiananmen Square and finishes at the National Olympic Sports Centre stadium. The creation of the race, which was international in nature from its inception, was part of a wider movement to open up China and its culture to foreign innovations – a change which was led by Deng Xiaoping, who sought to move China away from its Maoist past. The 2014 edition of Beijing International Marathon held on 19th Oct is in news for wrong reasons. The organisers warned runners to expect slight or moderate smog, but the US embassy in Beijing said air quality early on Sunday was "hazardous". BBC report quoting a resident of the city states that the air smelt like burnt coal. 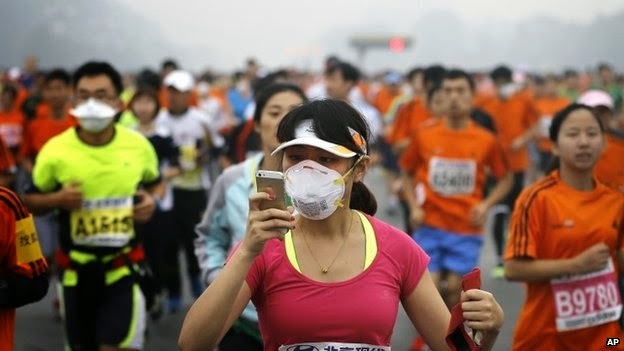 Despite heavy pollution blanketing Beijing on Sunday, the marathon went ahead, with face masks and sponges among the equipment used by competitors to battle the smog. The marathon's organizing committee said late Saturday that postponing the event would be difficult because of all the planning that had gone into it, and asked competitors to understand, the Beijing News reported. It said 46 percent of the competitors had traveled from abroad and other parts of China to take part. About 30,000 people were expected to take part in the marathon and the half-marathon. The organizing committee made 140,000 sponges available at supply stations along the marathon route so runners could "clean their skin that is exposed to the air," the Beijing News reported. The U.S. Embassy, which tracks the Beijing air from a monitoring station on its roof and uses a different air quality index, said the air was hazardous. It gave a reading of 344 micrograms per cubic meter of PM2.5 particulate matter. The World Health Organization considers 25 micrograms within a 24-hour period a safe level. 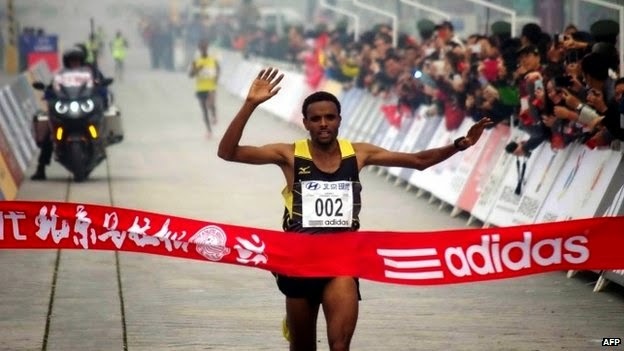 Reportedly some top long-distance athletes stayed away from the race, which was won by Ethiopia's Girmay Birhanu Gebru in two hours, 10 minutes and 42 seconds. His compatriot Fatuma Sado Dergo was the fastest woman with a time of 2:30:03. The winner(s) will not surprise people as runners from Africa- more specifically Kenya and Ethiopia in East Africa — have been dominating and have been winning marathons everywhere. the most powerful women in football ! Dr MAV Swami mani vizha malar veliyeedu ..
Putin's siberian Tiger defects to China ... ! !